Donald H. McCrackin, of Eau Claire, WI, passed away peacefully on Saturday, January 19, 2019, at Dove Healthcare – West, Eau Claire, surrounded by his family. Don was born on April 12, 1926, in Eau Claire to Ernest and Florence (Danielson) McCrackin. He graduated from Eau Claire High School with the class of 1944. 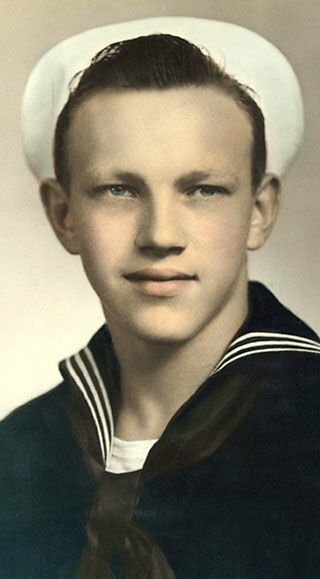 He enlisted in the US Navy, stationed at Hollandia, New Guinea, and was honorably discharged in 1946. On October 13, 1947, Donald was united in marriage to Doloris E. Wik at St Patrick’s Catholic Church in Eau Claire. Don or “Mac” had owned and operated several service stations in Eau Claire for numerous years. He retired in 1991 from the Eau Claire School System. He was very active in the Knights of Columbus as a Grand Knight and was a charter member of St. Olaf’s Parish. He and Doloris enjoyed traveling from Florida to California along Hwy 10. Don enjoyed taking the scenic routes, finding the less traveled roads along the way when he got bored with interstate travel. These routes proved to be the most memorable. He loved the outdoors, whether it was gardening, fishing for trout in the spring, 4th of July family reunion at Boot Lake, bird hunting in the fall, deer hunting with family and teaching his sons and grandsons about gun safety while hunting. He was very proud to be a “Winter Texan” in San Juan, Tx. They wintered there for 15 years and made many good friends. It was their second summer (winter party place) for 4 – 5 months a year, where they enjoyed endless porch parties! He is best known for his quick wit, sense of humor and his Irish charm! He was a remarkable man, once you met him you never forgot his charming ways. Four o’clock was special to him, as everyone knows, time to sit back with a “Jameson” and call it a day! Donald is survived by his wife, Doloris; daughter, Suzanne Sumner; sons, Patrick (Mary), Michael (Arlette DeShane) & Christopher (Diane); 10 grandchildren, Ann (Al) Olson, Quinette (Scott) Hotchkin, Kim (Tony) White, Bridget (Nick) Brenner, Charlie (Rebecca) McCrackin, Britany McCrackin, John (Megan) McCrackin, Matthew (Anna) McCrackin, Rebecca McCrackin, Brian McCrackin; 13 great-grandchildren, Abby & Alison Olson, Ella Hotchkin, Kayla & Trey White, Collin Meyer, Emily Brenner, Ruby & Stanley McCrackin, Charlotte & Duke McCrackin, Elizabeth & Mason McCrackin; sister, Beverly Holbrook; and several nieces and nephews. Donald was preceded in death by his parents, Ernest & Florence (Danielson) McCrackin; father and mother-in-law, Anton and Mabel (Johnson) Wik; son-in-law, Michael Sumner; grandson, Benjamin McCrackin; and great-grandson, Samuel McCrackin. A special thanks and sincere gratitude to the wonderful staff at Dove Healthcare - West and Mayo Hospice - Palliative Care for the excellent and compassionate care given to Mac during his stay. Also, special thanks to the staff & friends at Good Shepard Senior Apts. Don really enjoyed living there for the past few years. A Mass of Christian Burial will be held at 10:00 a.m., Saturday, April 13, 2019, at St. Patrick’s Catholic Church, 322 Fulton St., Eau Claire, WI, with Father Brian Jazdzewski officiating. Visitation will be from 9:00 am. until the time of the service at the church. Burial will be in St. Patrick’s Catholic Cemetery, Eau Claire. Military Honors conducted by VFW Post 305.